The great green macaw, Ara ambigua, the second largest new world Psittacine, has a limited distribution, restricted to lowland wet forests between eastern Honduras and western Colombia (A. a. ambigua), with a small isolated population of less than 2 dozen individuals near Guayaquil, in western Ecuador (A. a. guayaquilensis; Waugh, 1995). Fjëldsa et al. (1987: in Sibley and Monroe 1990) suggested that the population in western Ecuador is intermediate between A. ambigua and A. militaris and probably of hybrid origin; the two may be conspecific. Due to its limited and actual contracting range this species is listed by the Convention on International Trade of Endangered Species (CITES) as Endangered (Appendix 1 of the CITES Red Lists). IUCN: Endangered (A2c, d; C2a) . The great-green macaw occurs in humid lowland forests on the Atlantic slope of eastern Honduras, Nicaragua, and Costa Rica, locally on both slopes in Panama, and north-western Colombia (AOU 1983, Ridgely 1982, Forshaw 1989, Sibley and Monroe 1990, Stiles and Skutch 1989). The Central America populations apparently exist in four separated sub-populations that are restricted primarily to Atlantic lowland forests. The westernmost population occurs in northeastern Honduras and northwestern Nicaragua. J. Barborak (in litt. 1997) reports that it is uncommon in Rio Plátano, Honduras, its primary refuge in that country. Its status in northwestern Nicaragua is unknown. The second Central American population of A.a.ambigua is restricted to Atlantic wet forest in eastern Nicaragua and Costa Rica. Stiles (1985) reported that on the Costa Rican side, the species had been reduced to dangerously low levels and attributed its decline during the previous 15 years primarily to habitat loss and fragmentation. Another discrete Central American population is a small relic of perhaps only a few individuals in the wetter forests on the southern tip of the Azuero Peninsula (D. Tovar in litt. 1997). The Darien populations in eastern Panama and the Chocó of western Colombia are still relatively common at least in the Darien Biosphere Reserve (R. Ridgley 1982, G. Angehr in litt. 1996). In Colombia it has been reported at Los Katíos National Park and around Utría National Park in Serranía de Baudó (P. Salaman in litt. 1997). With low but unknown population numbers in Central America, the species may well number fewer than 2,500 mature individuals, with no sub-population greater than 250 mature birds. With so many threats acting on the species (habitat loss, trapping, and persecution for the cage-bird trade, and to some extent, poaching birds for food), a decline of 50% over three generations in terms of range and number of mature individuals is projected. At the onset of a seven-year study led by Ph. D. George V.N. Powell in 1993, little was known about the ecology of the great green macaw. While it was thought to migrate seasonally and use a variety of sub- habitats at different elevations, its nest was undescribed by scientists, and its primary habitat and food sources were largely unidentified (Stiles and Skutch, 1989; Martinez- Sanchez, 1991; Thorn 1991). Currently the most detailed information for the species comes from G. Powell's study. The study centered around the use of radio- telemetry methods to determine home ranges of and habitat use by the macaws. In addition, G. Powell's team monitored the status of all known or suspected nest sites and collected data on nest site characteristics. The fruiting phenology of tree species that were discovered to form part of the macaw's diet was also taken into Powell's study. Through Powell's study, it was determined that in Costa Rica the current breeding range of the great green macaws is restricted to an area of about 1,120 square kilometers in the northern zone of the country, along the Nicaraguan border. The forest in the area is marked by the presence of large almendro trees (Dipterix panamensis), a species that is now one of Costa Rica's primary sources of hardwood for flooring and truck bodies. Data on nest fidelity is limited to 13 adults marked with radio-transmitters between 1996 and 1999 (renesting: y= 3, n= 10). Based on that data, it has been confirmed that breeding pairs do not generally occupy the same nest hole in consecutive years. 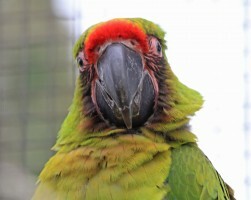 Using the Mayfield method (Mayfield, 1961,1975), a statistically accepted analysis which allows one to calculate the probability of a nesting attempt succeeding without finding the nest at inception, the team was able to calculate the probability of nesting success for the great green macaw. With the monitoring of 18 successful nesting attempts involving 15 nest holes during five years and a total of 33 young, the productivity per successful nest equal 1.83 young, with a standard deviation of 0.514. Over the course of the study, the team rigorously monitored first-year survival of 23 fledglings from 12 nests. Of the 23 juveniles, 15 that fledged successfully survived until the start of the next breeding season when juveniles separate from adults. Therefore, 65% of young that survived incubation, brooding and fledging also survived the first year. An average of 1.25 birds per successful nest with a standard deviation of 0.754 survived the year. The seed of Dipterix panamensis is the one food previously identified as important in the diet of great green macaws (Stiles and Skutch 1989). Phenology data collected on Dipterix reveals that the green macaws' consumption of this species reflects its availability. No other direct correlation has been drawn between fruiting and consumption; however, Sacoglottis trichogyna (Titor) emerged as a favored food source when Dipterix panamensis became scarce or unavailable. Based on the initial fieldwork, four years ago the remaining population was estimated at no more than 25 to 35 pairs of breeding birds. After more years of intensive fieldwork and communication with a Costa Rican populace increasingly aware of and on the lookout for this species, we have received no reliable evidence that green macaws are breeding elsewhere in the country. Despite the extensive data collected in the area, no evidence has been found that would cause the alteration of the earlier conclusion that fewer than 35 pairs are breeding annually in the northern zone of Costa Rica. The research team presumes the Costa Rican population to be part of the larger breeding population inhabiting southeastern Nicaragua. In Costa Rica, nestlings were reported to be worth about $150 to $300, and poaching in the relatively accessible breeding range of the Costa Rican population is widespread (Bjork and Powell 1995). Although, all psittacines in Costa Rica receive legal protection from being taken from the wild, rarely are the laws enforced; poachers have little fear of being apprehended. The estimated total number of great green macaws in Costa Rica probably averaged around 200 individuals during the years of the study. This rough estimate was based on extrapolation from observations of flocks that were encountered in the breeding area and in adjacent parts of the Atlantic lowlands and foothills. It was also estimated that during any given year, there were not more than 30 to 35 reproductively active pairs of green macaws in Costa Rica. This conclusion was based on the fact that despite extensive searches there has not been more than 19 nests active during a given year. 1. Nuclear areas of absolute protection in the macaws' breeding range. These core areas should include 52,500 hectares of habitat appropriate to the needs of nesting pairs. 2. A 143,500-hectare buffer zone surrounding the nuclei. The buffer zone would consist of sustainably managed natural forests, plantations of native species, and areas of low-impact land use where almendro and other key food species are left standing. Snyder, N., McGowan, P., Gilardi, J. and Grajal, A. (eds.) 1999. Parrots - Status Survey and Conservation Action Plan. IUCN, Gland, Switzerland and Cambridge, UK. Powell, G., Wright P., Aleman U., Guindon C., Palminteri S., Bjork R. 1999. Research Findings and Conservation Recommendations for the Great Green Macaw in Costa Rica. Tropical Science Center, CR. AKJ 2018 - updates on this project would also be gratefully received. We will be pleased to receive further articles and information of interest to add to our Web Site or for publication in our Magazine. Please forward by post or by E-Mail to The Parrot Society UK for the attention of The Webmaster. We review all submitted articles and the society reserve the right not to publish articles at their discretion. Their decision is final in all these matters and no further correspondence will be entered into.